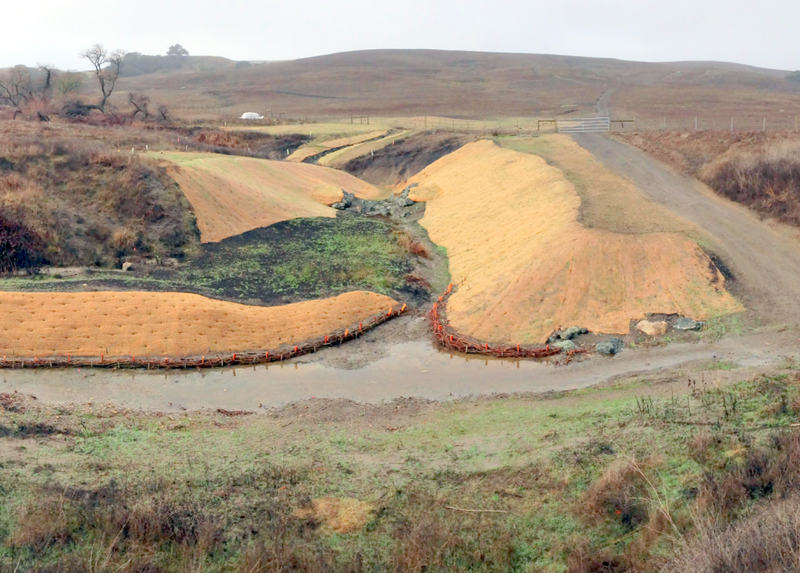 Tolay Creek Stabilization and Restoration | Prunuske Chatham, Inc.
PCI designed and installed restoration measures in lower Tolay Creek and a severely downcut and eroding tributary as partial mitigation for the widening of Highway 101. Various repair strategies were evaluated for each reach, and PCI worked with Sonoma Land Trust and Cal Trans staff to develop a mitigation repair strategy acceptable to the San Francisco Bay Regional Water Quality Control Board, California Department of Fish and Wildlife, and the U.S. Army Corps of Engineers, and develop construction-ready plans and specifications. Construction began in summer 2013 and included floodplain/meadow restoration in the upper tributary, stabilization of the lower tributary reach with rock grade control structures, recontouring of highly eroded banks, and floodplain creation along the confluence with mainstem Tolay Creek. Side gullies were stabilized with a rock channel and willow walls. A new stream channel was constructed for 500 linear feet based on reference reach dimensions and slopes of the intact upstream channel. Large rock grade control structures and boulder step-pools were used to stabilize fills placed in the gully and to raise the channel to allow for hydraulic reactivation of the adjacent floodplain/meadow areas. PCI also designed a revegetation plan using native sedges and rushes to stabilize the channel bottom and a variety of native woody species to reestablish the riparian habitat. Volunteers with Students and Teachers Restoring a Watershed planted the site during the fall and winter of 2013, and PCI provided post-construction channel stability monitoring.